The ChartTitle is a content control placed at the top of each chart control. 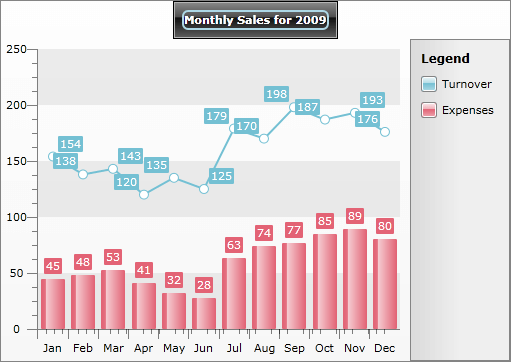 It is used to display any title information regarding the visualized chart. radChart.DefaultView.ChartTitle.Content = "Monthly Sales for 2009"
Since ChartTitle is a content control, you can set as its content not only textual data but also any other type of controls. The following example demonstrates how to create custom chart title with TextBlock in a Border control. If you want to learn more about styling the ChartTitle take a look at the Customizing Title topic.